What has been reported to be one of the most fair and balanced television presentations on 9/11 is set to air tomorrow night on TruTV. The show, Conspiracy Theory, hosted by former Governor Jesse Ventura, has already been determined to be the most popular show ever on TruTV since the first episode aired last week. The first episode was on HAARP, the 9/11 episode will air tomorrow. The film focuses on Texas-based radio host Alex Jones and some of his peers, who are on a mission to expose what they believe to be a massive conspiracy that threatens the world. A documentary listens to believers in government plots and ill-intentioned cabals. “New World Order,” which premieres today on the Independent Film Channel, is a film about people battling with phantoms. They are volunteers in an "information war" who see as clearly, as John saw his four Apocalyptic horsemen and seven trumpeting angels, that 9/11 was an "inside job," that the military-industrial complex killed Kennedy, and that an international "power elite" is plotting to enslave us all, excepting for those it will kill outright. Allusion to 9/11 Truth on "Sleeper Cell"
"What idiot could believe that Osama bin Laden and his cave-dwelling Muslim militia managed to outsmart the CIA, the NSA and the Pentagon unless Uncle Sam was behind the whole thing?" I don't know the context of these comments. Menon's article is otherwise a delusional meditation on how realistic "Sleeper Cell" is. 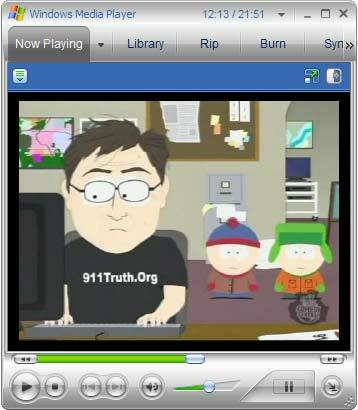 Looks like Fox News picked up on Steven Jones's Early Retirement..
Tonight Southpark focused on 9/11 conspiracy in their latest episode. I say 'focused on' quite loosely in that 9/11 conspiracy was really a sort of side show to the episode, and not the entire focus. While the episode covered some of the more common 'conspiracy theories', it didn't go into much detail on anything substantial in relation to the growing movement of those that question 9/11. Looking back on the last 2 years of my personal involvement in this subject I would have to say this is probably the largest, but definitely not the most even-handed, coverage given so far to 9/11 skeptics. But this gives me an idea. Why doesn't the Senate threaten to revoke the license of all of the mainstream media companies for lying non-stop about 9/11, and failing to give fair coverage to the many credible people saying -- and facts showing -- that 9/11 was an inside job? Should we start a campaign to revoke their licenses (unless they start accurately covering 9/11 and false flag terror in general)?